Foredom's newest, most powerful flexshaft unit. 1/3 Horsepower, 110V, permanent magnet DC ball bearing motor. Maximum no-load speed - 15,000 rpm. Foredom TX motors offer more torque and power across entire speed range. Provides greater control of tools at every speed, even under heavier loads. Includes F77 outer sheath and F93 inner cable. SXR foot control in metal housing. 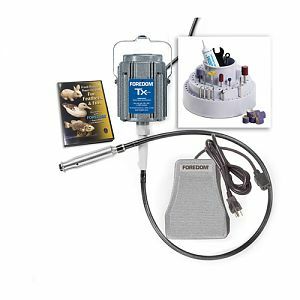 AKWK53 - 26 piece Accessory Kit with rotating bur holder. Flex shaft grease and spare motor brushes. 3 Disc DVD - Fur, Feathers & Fins and How to Power Carve.